In the corporate world’s tortured language, workers are no longer fired. 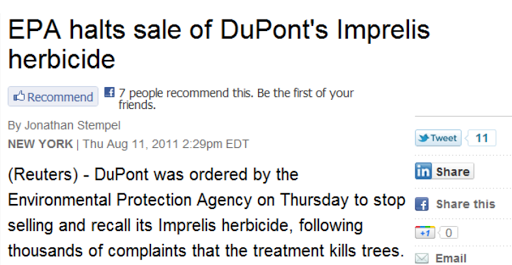 They just experience an “employment adjustment.” But the most twisted euphemism I’ve heard in a long time comes from DuPont: “We are investigating the reports of these unfavorable tree symptoms,” the pesticide maker recently stated. The culprit turns out to be Imprelis, a DuPont weed-killer widely applied to lawns, golf courses, and — ironically — cemeteries.